The City of San Juan Bautista has a culturally rich heritage that is actively celebrated. Spanish expeditions arrived in the San Juan Valley in the late 1700’s. The Spanish settlers came in contact with an Ohlone tribe known as the Mutsun, who inhabited the area. From the late 18th Century to the mid-19th Century, Spanish and Mexican settlers, with the help of the Mutsun, built 128 adobe buildings along the El Camino Real; a section of the old El Camino Real trail is visible below the cemetery. Mission San Juan Bautista, named in honor of St. John the Baptist, was established on June 24,1797, by Father Fermín Lasuén, Franciscan missionary and successor to Father Junípero Serra. 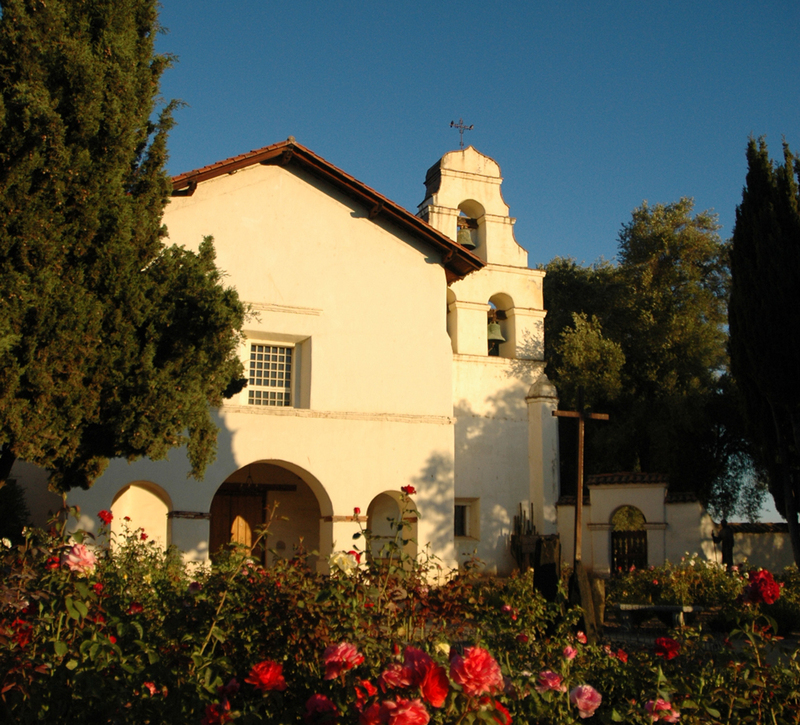 Known as the Mission of Music, it is the 15th and largest of the 21 California Missions. Mission San Juan Bautista is an active parish church, serving a mostly Spanish-speaking community in much the same setting as in 1820. Of the mission quadrangle, only the large front wing remains. The San Juan Bautista Plaza Historic District, which includes the Mission, is a National Historic Landmark that celebrates this history and provides an intact example of traditional Spanish-Mexican colonial architecture that dates from between 1813 and 1870. The City, which originated around the Mission, was established in 1869. Church: 188’ long, 72’ wide, 40’ high. Made of adobe; tile roof; tile floor; 3’ thick walls with cement supports. Style: Three aisles, rather than one, distinguish this mission church from others. Open-arched walls separate the side aisles from the main aisle. Inside walls were painted in native-style designs and bright colors by Thomas Doak in 1820, a Boston sailor who settled in San Juan Bautista. Some walls are painted to look like marble. Bright red drapery wall behind the altar holds statues in niches, including a life-size statue of St. John the Baptist. Bell Tower: Original church had no bell tower; bells hung from a wooden crossbar in the yard. A New-England-style steeple added in 1867 was destroyed in 1915; a stucco tower from 1929 was removed in 1949. In 1976 a campanario (bell wall) in the style of other missions was erected. The present campanario has three bells, two of which are original; the third is a recent gift from Father Lasuén's home village in Spain. Mission Compound: Living quarters were in a wing 230’ long, fronted with 19 arches. Two of the arches (1st and 13th) are square instead of rounded, perhaps to allow for processions. A large kitchen had a fireplace along the entire length of the room. Also in the quadrangle of buildings were workshops for carpentry, weaving, candlemaking, and leatherwork. Mission Grounds: Included 36 acres of pear and apple orchards, and many herds of animals, making this a rich mission. Hides and tallow were traded with the ships that harbored at Monterey. 1798 Church and other buildings were completed of adobe with mud and tule roofs. 1803 Cornerstone laid for a larger church, needed both because of earthquake damage to the first church and because so many Native Americans came to the mission. 1808 Father Felipe del Arroyo de la Cuesta enlarged the church plans to include three aisles. 1812 June 23, dedication of new church. Several earthquakes had convinced Father Arroyo to have the arches separating the aisles filled in, making a single-aisle church. 1814 Town began to grow up around the mission. A plaza was laid out in front of the mission and adobe barracks for soldiers built across the plaza. 1835 Mission secularized; lands taken by the government; priests continued to perform services there. 1859 55 acres of land and remaining buildings returned to the Catholic Church. 1867 Father Rubio begins a period of extensive modernization: steeple added, interior walls, and floor covered with wood. Post 1906 Though built right on the San Andreas fault line, the Mission sustained relatively little damage by the1906 earthquake, perhaps because the interior arches had been filled in. The buildings were subsequently strengthened with steel and concrete. 1949-1950 The stucco tower was removed and the bells were put back on a crossbar. The interior was also restored to its 1820 condition. 1976 Renovations included opening up the arches into the side aisles; the bell wall was added; kitchen area restored; museum with artifacts from the Mission's past.